The tiny village of Khor is situated in the deep interior of Rudraprayag District. 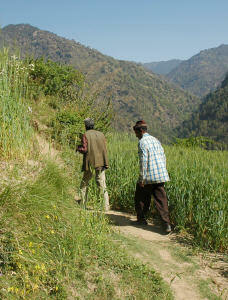 It is 10 km from Chenagarh reachable by walk only through hilly windy paths. One has to climb on foot for ca. 3 hours before reaching the tiny village of Khor. Located on an elevation of 1400 m, Khor has a full panoramic view of the Himalayan range and terrace fields. Local potatoes are of the best quality and most are exported. The Nagnath Temple, that is 2 km away, is the nearest place of worship. Omkarananda Saraswati Children Academy, Khor, has been founded in 1996 and is now running classes from Nursery to Classes V. The School also offers cultural education in music, songs and dances.